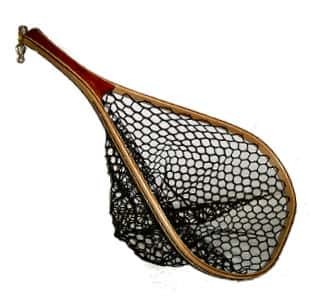 Fisknat Yak Net comes with lightweight rubber net - BOW: 11"X17" HANDLE LENGTH: 7" OVERALL LENGTH: 24". You have a choice of black or clear bag on every Fisknat Yak net. I've used this net for a couple of years now and it is excellent in terms of workmanship, design and overall dimensions. I've tested it on fat brown trout up to 22 inches so far and it's the bomb. This is my first rubber net and it's much easier on the fish than any other net materials I've used. Hooks are easy to recover and, once in the net, fish often seem to unhook automatically when using barbless hooks. Periodic toughup with Tru-Oil keeps it looking new. I'm picking up a second one for my son-in-law.